Are you ready to assemble? Comic Quest, the leading comic book store in the Philippines joins the upcoming Avengers: Endgame Special Fan Screening as one of the official sponsors for the event! Read the details after the break! Syndein Events is proud to announce another truly spectacular sponsor for our event... 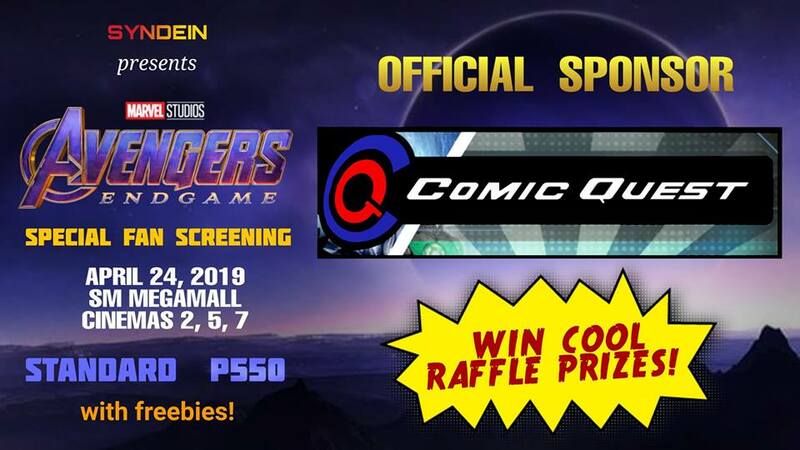 Comic Quest Philippines!!! FREEBIES and an AWESOME FAN EXPERIENCE awaits for you at our Special Premiere-Day Fan Screening of Avengers: Endgame! See the movie on OPENING DAY, get FREEBIES, participate in GAMES, win PRIZES, meet amazing COSPLAYERS, and so much more! TICKETS ARE GETTING SOLD OUT EVERYWHERE! Join our special fan event while you still can!! PLEASE NOTE that your ticket reservation will be forfeited if not paid for within 3 BUSINESS DAYS of submission. The slot will be reopened other fans. As this is an opening night screening, seats are extremely LIMITED. Tickets bought/reserved on a first-come first-served basis and walk-in purchases can be availed for the walk-in price at the registration booth should there be seats available. Keep up to date with all of our posts and surprises by liking our page and also by joining the event page! Tickets are limited by availability. Reserve your seat/s fast before they're all gone! We're in the End Game now. See you all at the screening!